They may be soft and cuddly now, but before long these super-pups will be providing a lifeline to disabled people under a pioneering scheme. The cute golden retriever-Labrador crosses were born to Labrador guide dog mother Tina eight weeks ago. They are the first litter from a new collaborative programme between Stirling-based charity Canine Partners and English organisation Guide Dogs for the Blind, using parents from each of the organisations. The aim is to create a new generation of specially trained assistance dogs to help give disabled people more independence. Marnie, Murray, Martha, Magnum were yesterday being put through their paces in their second basic obedience training session by Canine Partners staff. The dogs will go on to learn how to unload washing, answer telephones, open doors and even help undress their vulnerable owners. Joy, Jack and Jodie have been enrolled at Guide Dog school in Midhurst, Sussex, and will be trained as more traditional seeing-eye dogs. 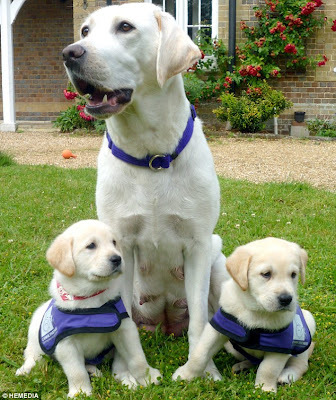 A spokeswoman for Canine Partners, who provided a retriever assistance dog for the breeding programme. said: 'Guide Dogs and Canine Partners are both charities under the umbrella organisation Assistance Dogs UK and often work together to train dual purpose dogs for people who are both visually impaired and wheelchair users. 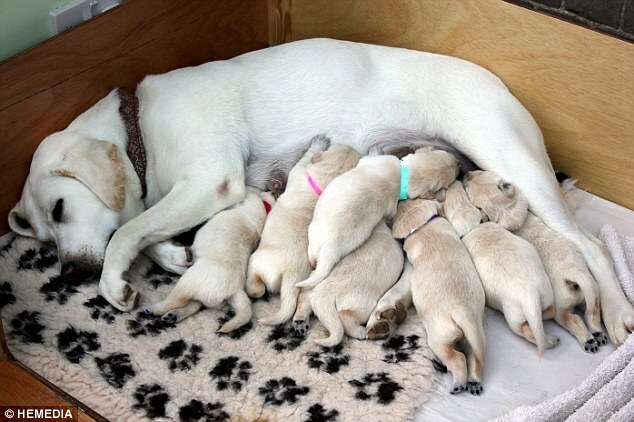 'This is the first time, however, they have joined forces at the puppy stage to share resources ensuring the seven puppies will go on to help someone with a disability. 'For many years, Guide Dogs have been offering some of their puppies to various assistance dog organisations, with many successful working canine partners having come through the Guide Dog breeding scheme.